All of the available data fields are listed here. Hold down the CTRL key to select multiple data fields at once. 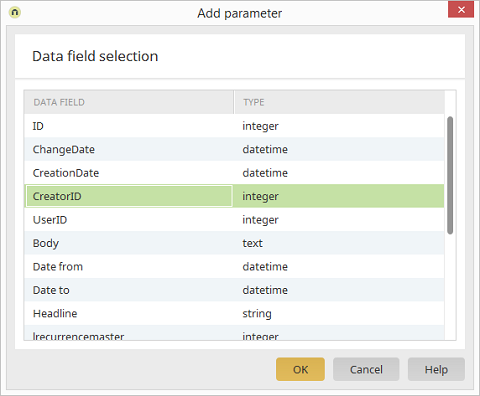 The data types of the data fields are shown here. Select the data fields that should be transferred or returned, respectively. Please note that data records that are inserted via a web service must return a unique ID. A non-unique ID will cause an error to occur during the web service call. The new data record will not be inserted in this case. If the ID is not entered explicitly upon input, the next free and correct ID will be automatically identified and used for the new data record.